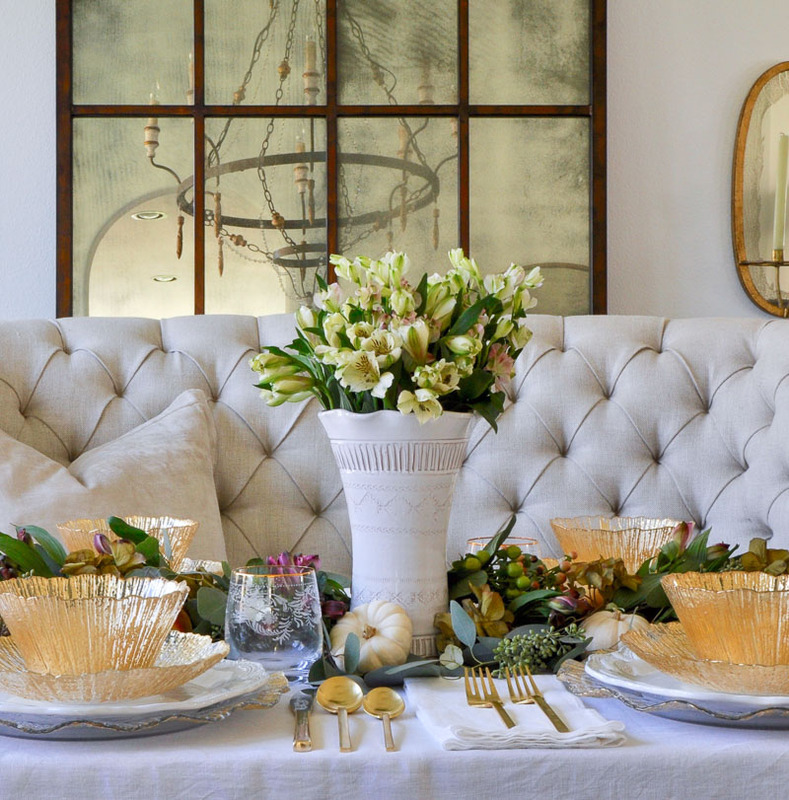 Welcome to our Thanksgiving Styled + Set Holiday Entertaining Tour! I always get excited to be able to share the designs and ideas of other bloggers with you, especially around the holidays. If you have made your way here from Maison de Cinq, thank you so much for stopping by! Also, a big thanks to our host, Lory from Designthusiasm. At the bottom of my post, you will find links to all of the bloggers participating in today’s tour. 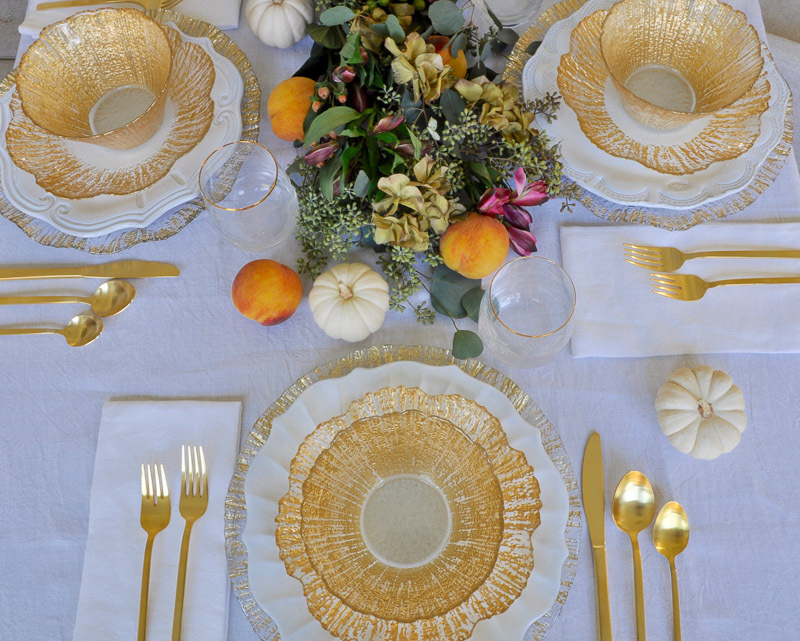 You will also find links to the bloggers sharing their Thanksgiving styling ideas later this week. Thanksgiving is about gratitude. It’s about family. It’s about a special meal. 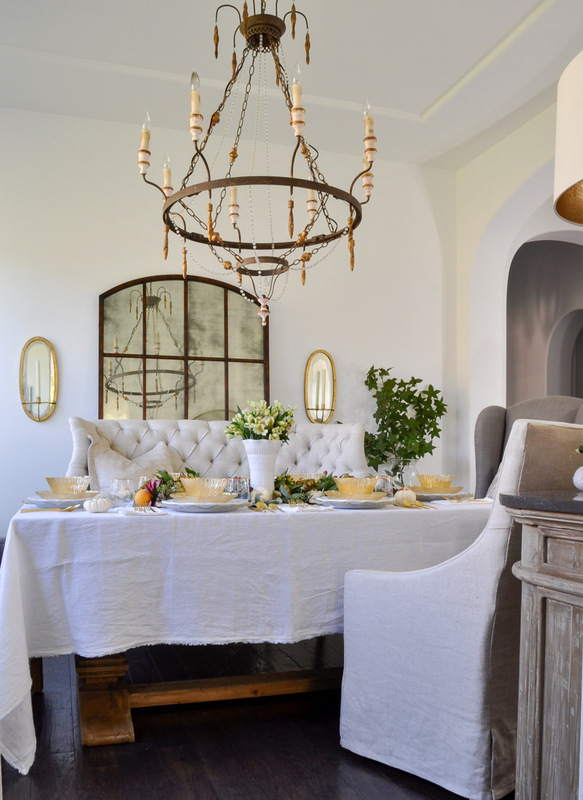 Most importantly, I always want our dining room to look beautiful and inviting. Sometimes, I know exactly how I’m going to style our table. Other times I start with one or two things I love and go from there. Today, I started with the dinnerware. 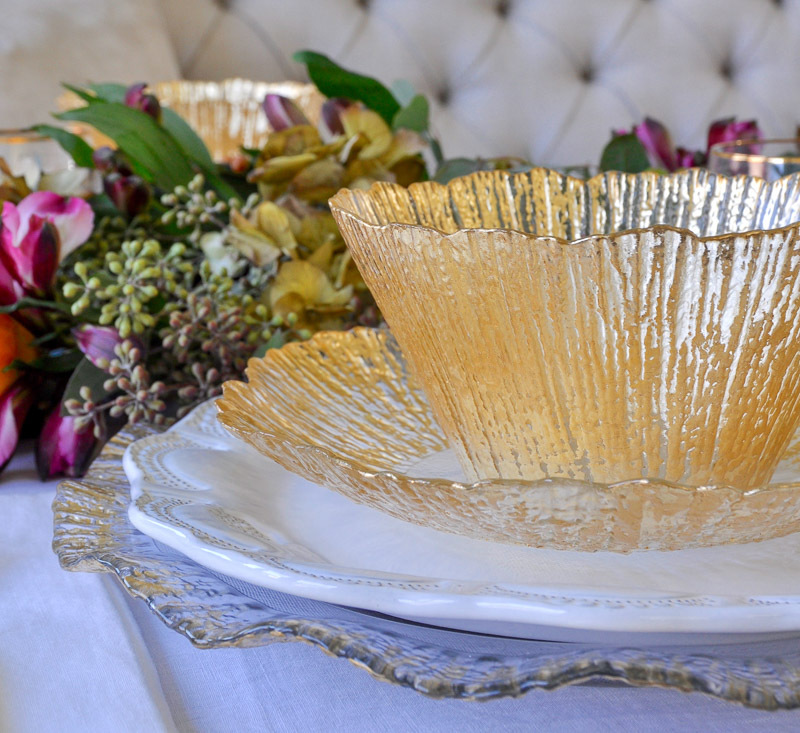 Once I laid eyes on these gorgeous pieces by Vietri, I knew they were the perfect addition to our newly updated dining room. And what a dream they were to style. They are sophisticated, yet not overly formal and they are incredibly beautiful, even more so in person! First, I started with my place settings. My first consideration is the menu. What are we having? Secondly, I want to combine pieces that compliment each other. And lastly, I like to do something unexpected. In this case, I chose three different styles of dinner plates. 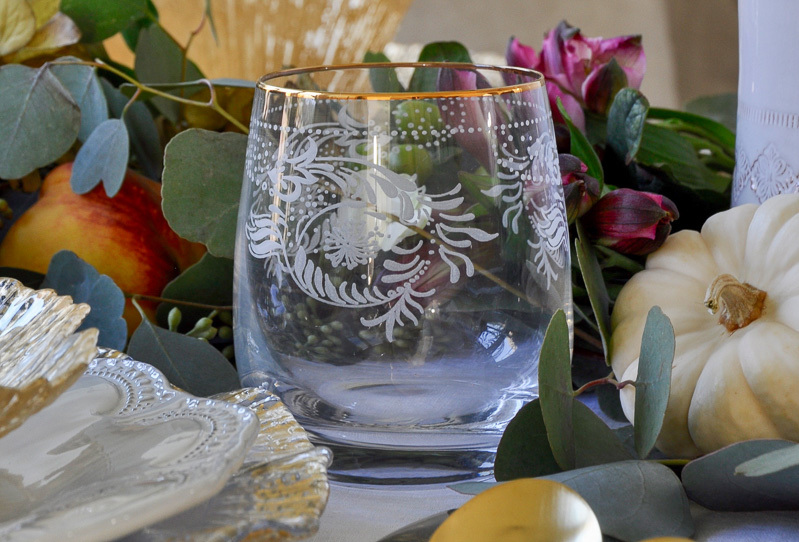 Next, I added gold flatware and stemless wine glasses for an elegant holiday look. I then added a detailed vase for height. It’s also by Vietri and makes quite a statement! To add a wow factor, I made a floral garland by layering eucalyptus, berries, flowers, fruit, and a few baby boo pumpkins. 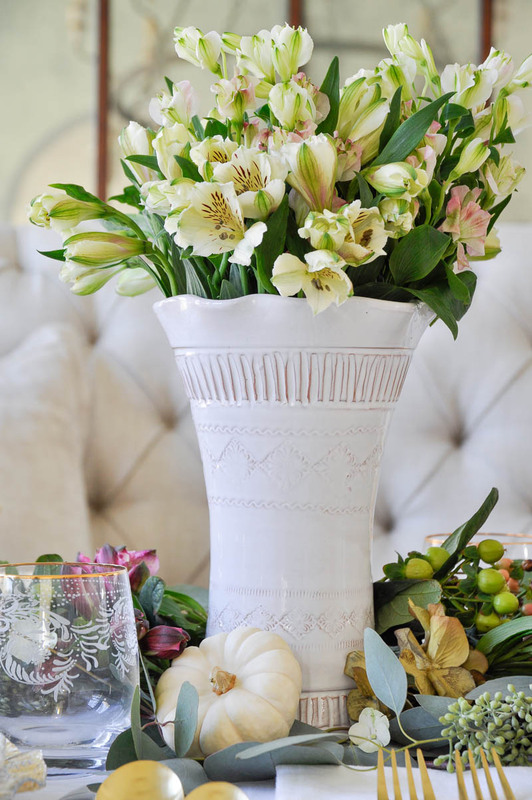 My favorite white linen tablecloth provides a lovely contrast. And this is the view from our kitchen. I hope you enjoyed my Thanksgiving styling ideas. 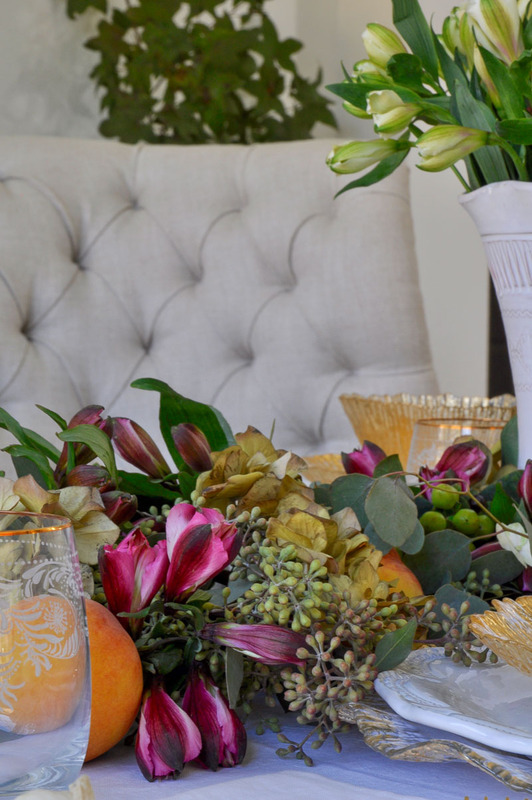 Happy Thanksgiving Table Styling! Before you move along through the tour, I’d love for you to subscribe so we can stay connected…..
Now you are in for a treat. 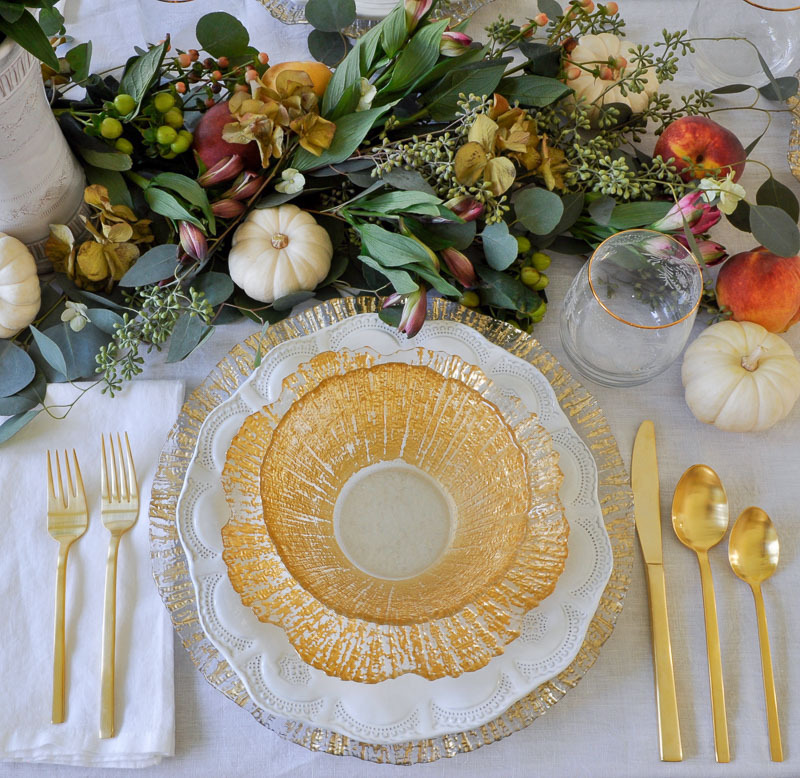 My sweet friend and fellow Texan, Rachel from Maison de Pax is sharing her best outdoor Thanksgiving table ideas. 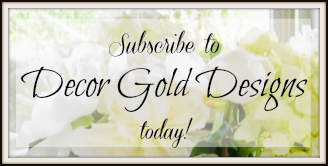 I just know you will love her and all of her wonderful decorating and entertaining tips! Looks beautiful! I would love to sit at that table and share with friends. Very pretty, very elegant. Beautiful job as always Jen! 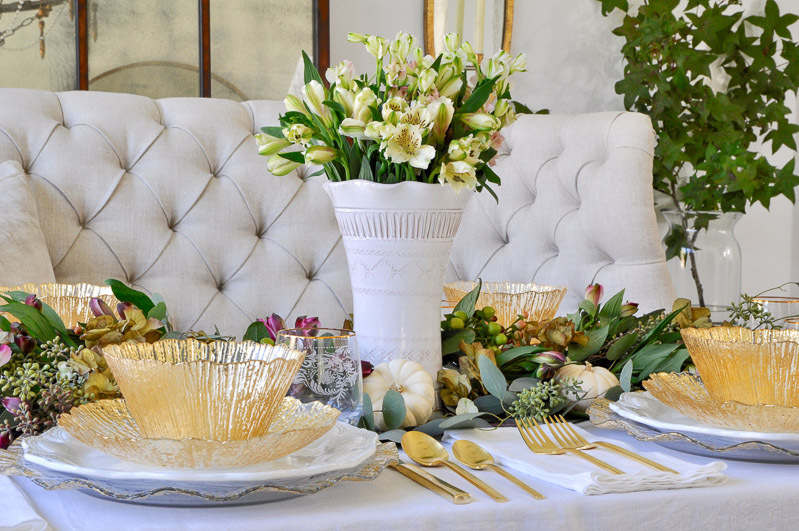 Love all your pretty finds from Vietri! The gold is so elegant. Cool chandelier, too! Wow! those bowls are so beautiful and fun! 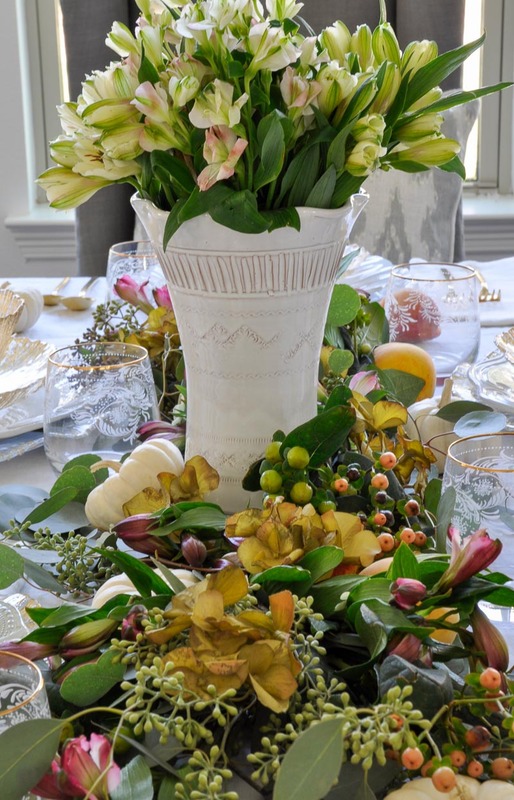 I also love the pop of color to bring this centerpiece to life! Such a stunner!! 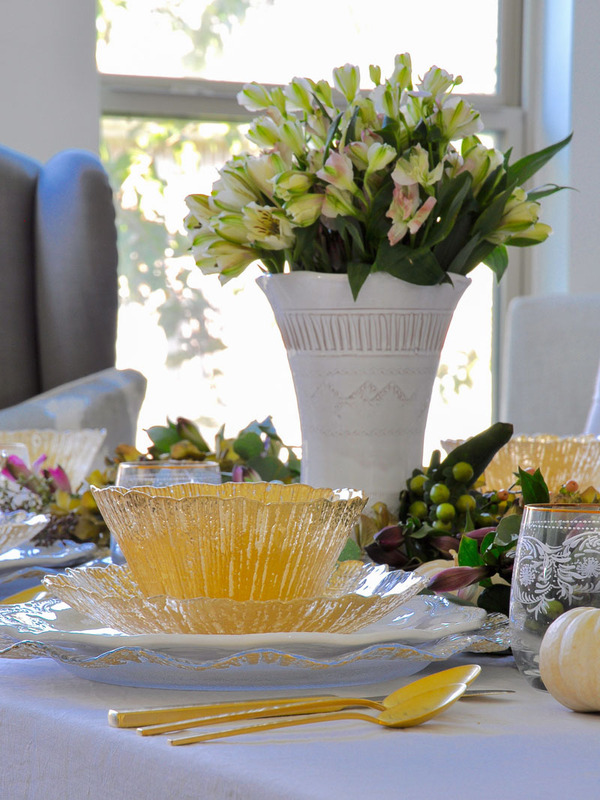 Your table is simply perfect for any holiday. I am developing a serious crush on those dishes. 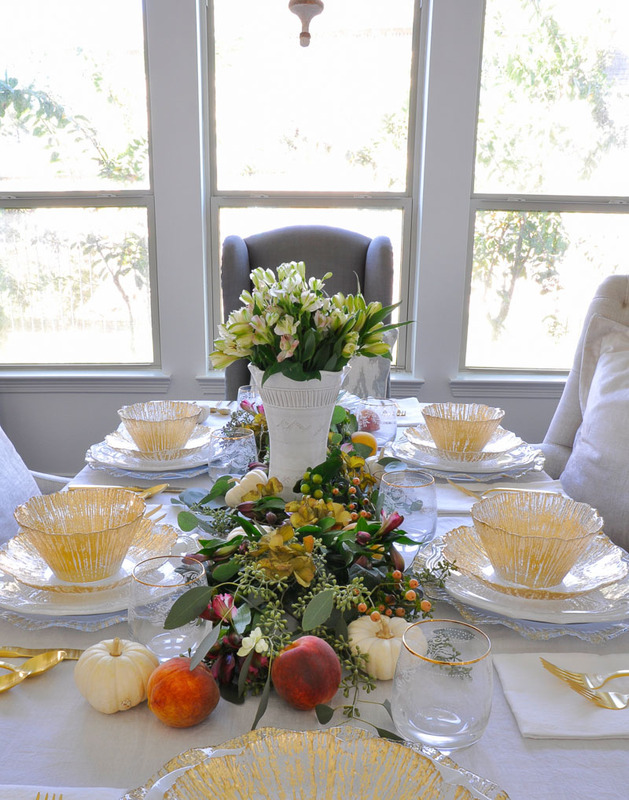 Jennifer, beautiful fall table scape, floral arrangements spectacular. I have a question from a post last Christmas, you had a tabletop Christmas tree between two chairs, the tree was decorated in gold. Was that an artificial tree or real, if it was artificial where did you purchase it? ?